Weekly Deals & More Rewards for Party Hosts! Happy Tuesday! I kinda took the weekend off, as it was our Thanksgiving weekend here; I still feel as stuffed as the turkey! But now I’m back, ready to share the new Weekly Deals, a change about the Weekly Deals, and a special offer for qualifying Stampin’ Up! parties! So, there will still be Weekly Deals each Tuesday, and the Deals will be just as good; but the number of products offered for the weekly deals will be less, and there will be limited amounts of each deal, to hopefully offset the backorder issue. However – this DOES MEAN that if you want to take advantage of the deals, you’ll need to ORDER RIGHT AWAY, so that you don’t miss out on the limited amount available! I’m only just learning this at the same time as you are; however starting next week, I will start posting the Weekly Deals just after 11pm Pacific Time, which is when I see them online, on the demonstrator only site. That way, you can place your order 1st thing Tuesday morning online, or call or email me with your order, and I will place it Tuesday morning. (the deal prices only come into effect the Tuesday morning). You can earn an extra 3% in Stampin’ Rewards (formerly known as Hostess Benefits) when your party reaches $400 or more! Instead of earning 12% on a $400 party, which equals $48 in Stampin’ Rewards, you will earn 15%, which equals $60 in Stampin’ Rewards! 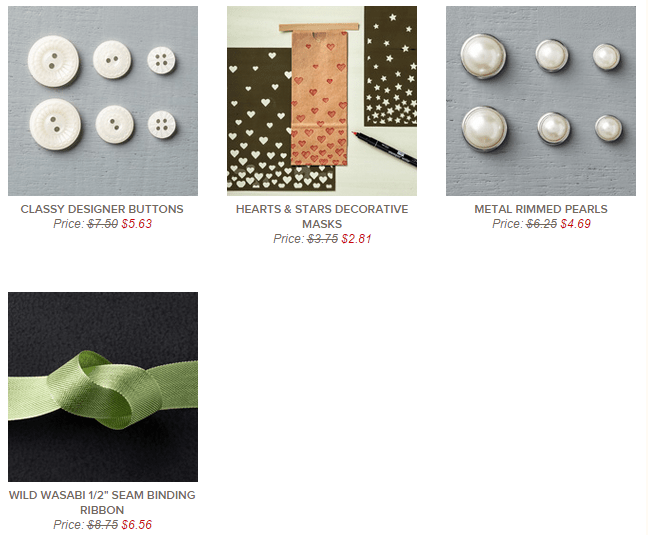 You can use your Stampin’ Rewards towards any product in the Catalogue, including the Exclusive Hostess Sets! Did you know – you can also use your Stampin’ Rewards $$ to put towards your Starter Kit? That’s right – host a party, and any amount you earn in Stampin’ Rewards can be put towards your $125 Starter Kit! For example – you host a party which totals $450. You earn $67.50 in Stampin’ Rewards. You put that $67.50 towards your Starter Kit, which means that you choose $155 in Stampin’ Up! products, get a free business supply pack valued at $70, get FREE shipping on your Starter Kit, and you PAY ONLY $57.50!! That means you’re getting $97.50 in free product – plus free shipping and the free business pack! Not to mention, as a demonstrator you will always get at least 20% discount on all of your future Stampin’ Up! product orders! Can you say SIGN ME UP?! 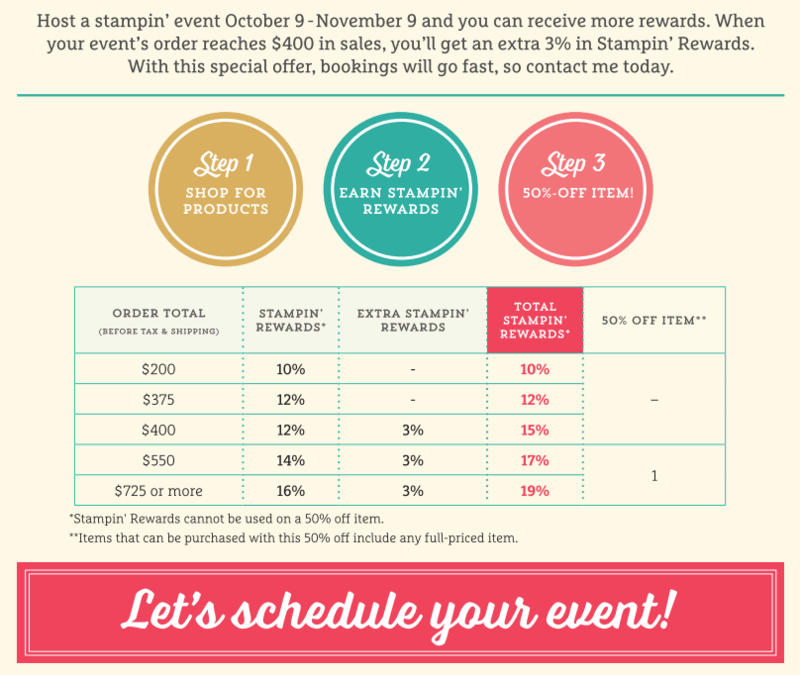 This fabulous deal for extra Stampin’ Rewards is available only through November 9th, so let’s BOOK YOUR PARTY NOW! You can have the traditional party with your friends & family in your home, or a ‘virtual’ party online, or a catalogue party where you collect orders, or a combination! Whatever works for you! Contact me NOW to schedule your party, before my calendar fills up! (you can still apply your Stampin’ Rewards towards your Starter Kit at any time; it’s just the extra percentage that is limited time).